My Grandpa’s been quite ill the past few months so I decided to make some biscuits to post him. I had some homemade crystalised ginger left that I thought he’d like and came up with a biscuit recipe to match. 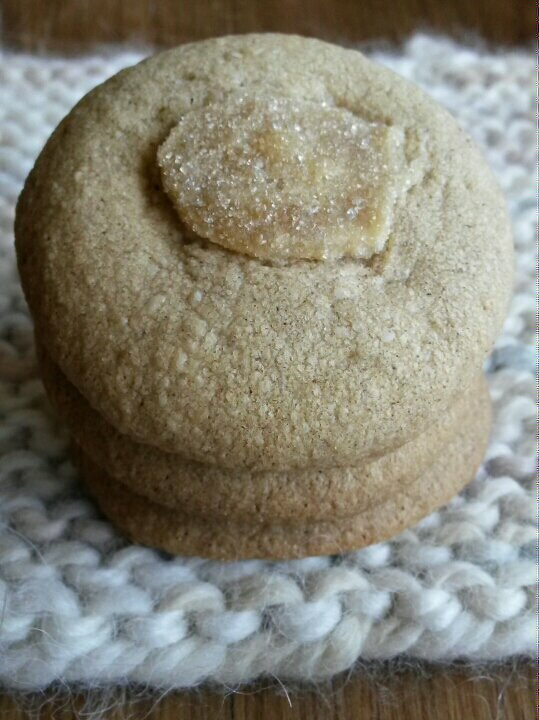 The recipe is loosely based on melting Moments, which I remember making with my grandma, but I wanted to add spice to the mix and top them with my crystalised ginger. Not owning custard powder, I added an egg yolk for richness. Molasses gives them a lovely caramel note that pairs well with some ‘old fashioned’ spices. These aren’t quite as smooth as their namesake, but are certainly very tasty. I’m sure Grandpa would agree. *I used my homemade crystalised ginger, but you could thinly slice some cubes of shop bought crystalised ginger. Cream the butter and icing sugar till light and fluffy. Add the egg yolk and molasses, mixing till just combined. Sift over the spices and flour. The mixture should form a soft dough. Roll the dough into teaspoon sized pieces and arrange on a lined baking tray. Press a slice of crystalised ginger on top of each ball and bake for ten minutes or until barely just golden underneath. Allow to cool on the tray for a few while before transferring to a wire rack to cool completely.